During the summer, one of my most frequent meals is “fresh from the farmers’ market”: fresh peas, some greens, and cornbread. By “peas” I mean one of the many varieties of field peas available here in the South in the spring and summer, such as blackeyed peas, lady cream peas, pink-eye purple hull peas, and lima beans (aka butter beans). It’s Southern cooking like I’ve been eating my whole life, and I think I’ve grown to love it more the older I get. I’ve written before about my standard technique for cooking field peas. Basically, they’re boiled in what becomes a flavorful broth, what we in the South call “pot likker.” When you serve them, you’d be missing a lot of the flavor of the dish if you used a slotted spoon to put them on the plate dry; instead we dip up plenty of the broth and put it on the plate, too. And when there’s broth, you need something to sop it up, right? That’s where the cornbread comes in. It’s not a side dish but an integral part of the meal! 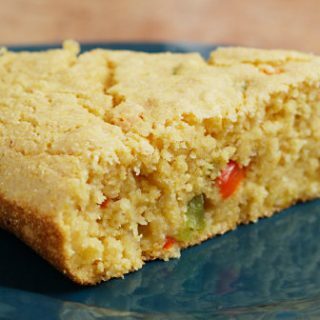 I’ve tried a lot of vegan cornbread recipes, but this is hands-down my favorite, moist and tender and flavored with little pieces of red and green pepper. You can make it spicy by adding jalapeño pepper or red pepper flakes or keep it mild by leaving them out. If you have it, use the soy yogurt, which gives a great flavor without sweetness, but if soy yogurt is unavailable, apple sauce works well too. 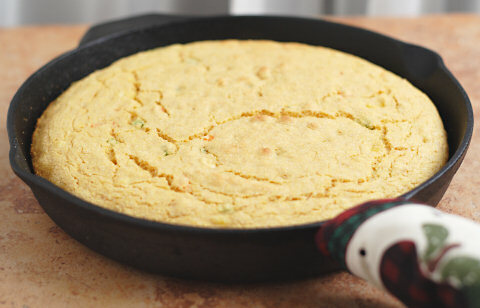 If you have a good, seasoned cast iron skillet, you’ll want to get it out for this cornbread, which really does taste better cooked in cast iron. Oil the skillet lightly and then preheat it along with your oven. As you pour the batter into the hot skillet, a golden crust begins to form immediately. You can get a crust using a regular baking dish, but it won’t be quite as crunchy or golden and it will take a little longer to cook. 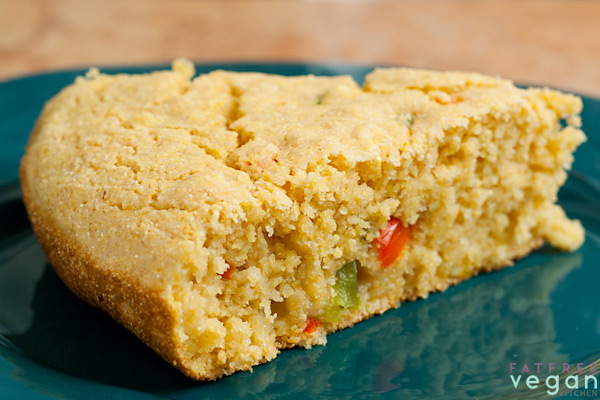 You can turn this into plain old cornbread by leaving out the peppers and corn...but why? One piece counts as 4 Weight Watchers smart points on the Freestyle plan. As I write this, I’m sitting in the lobby of the Chicago City Centre hotel, waiting for my room to be ready. I’ll be at the BlogHer2007 conference for the next few days, so if you’re attending, please flag me down and say hi. I’ll be the one lugging around an oversized laptop and a big camera case/backpack. Well, at least I am today. I have a feeling that both of these weights are going to be left in my room, once I can get into it. I’ll try to check in and post a few photos, but I make no promises. I’m here to party! I am new to this, so please bare with me. When you say 1 T enerG egg replacer powder, am I suppose to make the powder up to be like an egg, or am I just adding the powder and not mixing it with the water. Thanks, I love your site! Just mix the powder in with the other dry ingredients–no need to mix it with water first. Hope you enjoy it! I hope you had a lovely restorative time on your vacation. Happy Thanksgiving to you and yours. One of the things I am thankful for are the wonderful recipes on your blog–thanks so much for sharing them all with us! Thank you for this wonderful recipe! I used the agave instead of water and a corn salsa (no tomato) that I got at Trader Joes. It was spicy, and delicious!! Hello, if I was to make this using eggs rather than egg replacement powder how many would I need? You can try using 1/4 tsp. more baking powder and 2 tsp. ground flax seeds instead of the Ener-G. Or, if you have it, use 1 tsp. cornstarch, 1 tsp. flax, and 1/4 tsp. baking powder. This recipe is soooooo good. I took this cornbread to a “Red Green” party and took second place with it. I think the jalapenos were a surprise to the judges!! !lol Thanks again for such great recipes. Question: If I chose to use ground flaxmeal as my egg replacer, would that be alright? And if so, would you recommend I just add the meal directly to the dry ingredients, or should I combine it with the water first and add it to the liquid ingredients? Thanks much. I enjoy your blogs and website very much. Hi, Susan. I made this yesterday, though I didn’t have white wheat flour so I just used all purpose and I did have red and green pepper but was too lazy to chop 🙂 Anyway, it was delicious and, once I made the cornbread, I decided I just had to make chili to go with it. Anyway, I know this is your hands-down favorite cornbread recipe (it’s mine, too!) , but would you happen to also have a low-fat dry, crumbly recipe, too? It would be nice to have both. Every other cornbread recipe I looked up had gobs of oil in it. Hey, Susan. I think I *may* have found a recipe for low-fat crumbly cornbread, so if you don’t have one, that’s okay. Hope you found one you like, Ivy. I have a corn cakes recipe (corn bread made on stove) that’s crumbly, but then I thought this corn bread was crumbly, so I might not be the best judge! 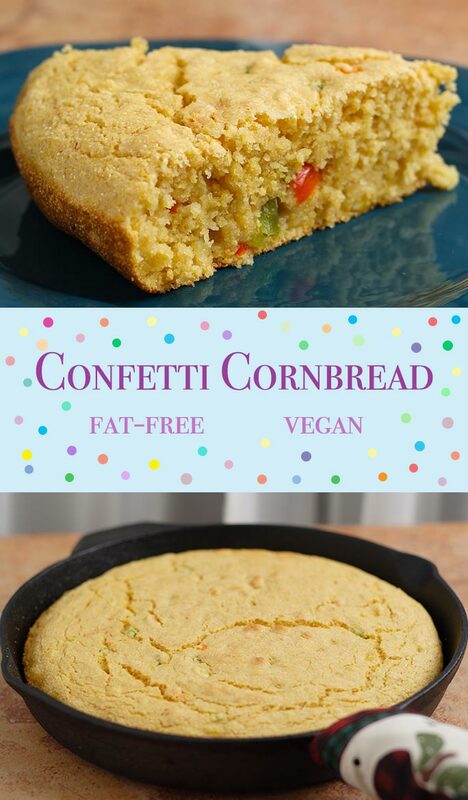 I adore corn bread, and was excited to try a vegan version. But my attempt turned out like a mushy, dense brick, so I’m wondering what I did! I didn’t have a cast iron skillet, so used a Pyrex baking dish. I can only guess that I needed to bake it longer. I also have a question about Energ Egg replacer. How long can it be stored for. I see it for sale for as little as $4. up to $40 for 16 oz. packages. What could be the difference. It keeps practically forever if you keep it dry. It’s basically just thickeners (potato starch) and leaveners (baking powder). I am hosting a Forks Over Knives house party for about 16 people, and I was wondering if this recipe keeps or freezes well. I would like to make a few batches in advance and then reheat if you think it would still be good? I can’t think of any reason why it wouldn’t freeze well. It should keep in the refrigerator for about 5 days. I know from experience it tastes best when made fresh, but a few days shouldn’t hurt it. Good luck! Hi Susan! This may sound ridiculous, but I just realized that your egg replacer is probably not the same as using egg beaters/liquid egg substitute. I’m not completely vegan and that’s what I use. Do you know how I would substitute that in for your egg replacer powder in your recipes, or even specifically this one? Thank you so much! Michelle, I think you would eliminate the 1/4 cup water and the egg replacer powder and use 1/4 cup egg beaters instead. I haven’t tried that, of course, so I can’t promise how well it will turn out. Can’t wait to try this! I love new corn bread recipes! Thank you for all of your great ideas! This bread is absolutely delicious! It will definitely be a staple in my household. I made this today, and it was great comfort food. Thanks for another easy and tasty recipe! Also, I am type 0 blood type and can not eat too much corn, and I so miss the taste of corn bread and corn meal muffins. Do you know any substitutions I can make? I’ve made this recipe many times and it always comes out perfect. I never have yogurt, always use applesauce, don’t have a cast iron skillet, and sometimes cut the milk in half with water when we only have vanilla flavored on hand :), but it never fails to turn out great. Someday I’ll get a skillet so I can get that nice crust, but even in a glass pan it comes out with a wonderful texture. I tried other oil free vegan cornbreads but they just weren’t very good and frankly they just weren’t cornbread. This one is a keeper. I have been unable to find plain soy yogurt. What I did find is either loaded with sugar or has fruit in it. Can you recommend a source? Earlier this year, Whole Soy, the main producer of plain soy yogurt, had something happen–lost their factory for some reason. They are supposed to be reopening in early 2014. Until then, I’m using apple sauce or blended silken tofu instead of plain yogurt. Having roots in South Louisiana, I always pay attention to your recipes. Many of us are not stateside where mamy products are not marketed, though. I am wondering if the egg replacement can be left out when preparing the cornbread as the recipe does include applesauce. The applesauce is a fat replacer and doesn’t act as a binder or leavener like the egg replacer will. But you can easily replace the replacer with 2 3/4 teaspoons of cornstarch or other starch (potato or tapioca) plus 1/4 teaspoon of baking powder. I have been following your blog for a while now. I’ve been a lacto-vegetarian all my life. I was trying to go vegan, and I was doing well till I discovered that I’m terribly allergic to soy products. I’d love to try your recipe for cornbread since I’ve made many of your recipes at home and my husband & I loved them, but can you please help me out by suggesting alternatives for the enerG egg replacer and soy yogurt? Thank you! Mine came out like rubber. In the garbage it went. Hate wasting food like that. I’m sorry to hear that but can’t imagine what went wrong. I’ve made it literally dozens of times and have never had a rubbery result. If you leave out the baking powder your cornbread comes out like a big hockey puck. It’s indestructible. Yes, just check it a little earlier because it will probably get done more quickly. I haven’t baked in my IP and I don’t think this would come out well it it. I just picture it being very soggy. Love Love Love your recipes. My husband and I think you are the best! I have made this many times but I just noticed something and thought I would ask you about it. The recipe calls for 1 tablespoon EnerG egg replacer powder (or 2 3/4 teaspoons cornstarch or potato starch plus 1/4 teaspoon baking powder). So, I used 2 3/4 tsp cornstarch. Is this correct? It’s just a tiny bit confusing and wanted to make sure I am doing it your way. Made this with 3 parts cornmeal and 1 part rice flour. Didn’t have peppers but still came out good. Made this evening in my brand new preseasoned Lodge cast iron 10in skillet I bought just for the occasion. The only thing I changed was I used the applesauce, and left out the egg replacer going for the 2 3/4″ corn starch route. In all, this spent 40 min in the oven (preheated skillet with oven) and still wasn’t cooked through, not just in the very middle, before the the crust burnt and top turned dark brown and I had to get it out of there. Even the uncooked version tasted good, but still a disappointment. I have no idea what could have gone wrong other than my old electric is no heating properly. I’m so sorry! I literally have never had that happen. I don’t know what could have happened.